Since the company started in 1921, Rust-Oleum has been offering innovative products that protect the surfaces from the elements. The sealers provided by Rust-oleum not only provide resistance and protection from the elements, but they also enhance the appearance of your concrete surface. Whether you’re looking for a high-gloss, low-gloss, wet look, penetrating concrete, natural look or elite sealer, Rust-oleum has different types to offer. Simply peruse through the various types of sealers and find out which one is ideal for your climate, concrete surface, and look. 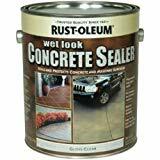 In this Rust-Oleum concrete sealer reviews, we’re going to look at the Rust-Oleum wet look and Rust-Oleum acrylic-based sealers. Both of them are easy to apply and dry very quickly. Read on to know more about them. 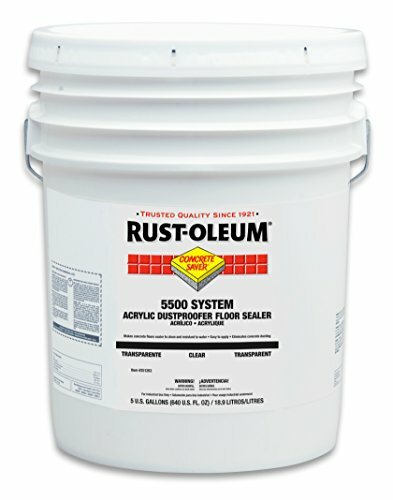 The Rust-Oleum 5500 system acrylic dust proofer floor sealer is made up of a formula that provides durability to the concrete surface. This means that your concrete will be protected for long and little maintenance will be required. In addition, the sealer has low odor. So, there won’t be a very strong smell. Applying this sealer isn’t a big challenge as it can be done by any DIYer enthusiast by using a roller or sprayer. The sealer covers a wide area and can be utilized both on the interior and exterior surfaces. The most ideal temperatures for installing the rust-oleum dust proofer are between 50 degrees F and 100 degrees F. The color of the sealer is clear and it is suitable for concrete and coated surfaces. When properly applied on your driveway or patio, this sealer will offer protection from dusting, water penetration, thaw cycles, spills, and prevent the growth of mold and mildew. It is also very easy to clean and dries faster. As a result, little time will be spent applying it. Related: Why buy Dustproofer H&C sealer? 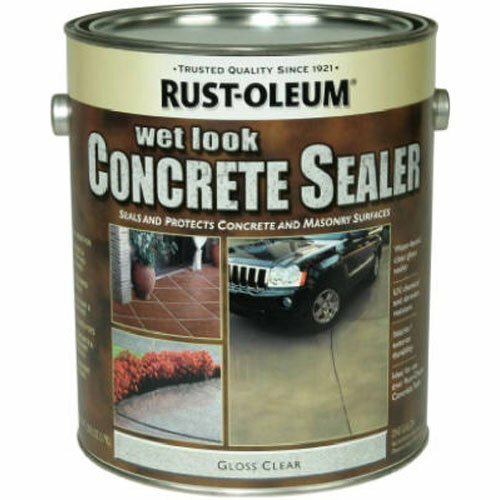 If you want your concrete to have the wet look, this is the best rust-oleum sealer for the job. The Rust-Oleum wet look sealer has low odor. Additionally, it is a penetrating water-based sealer which will ensure that your driveway, patio, or bathroom floor is sealed from the harsh elements. This includes water, deicing salts, oil, thaw/freeze cycles, peeling, pitting, etc. Apart from securing your concrete surface, the sealer as well protects it from UV rays and abrasion. One of the advantages of using this sealer is that you can use it both indoors and outdoors. So, it doesn’t limit you where to apply it. It also changes and beautifies your concrete surface with its excellent wet look finish. The only major issue is that you will have to reseal the concrete on a yearly basis as it is not very durable. The sealer enhances the color of the concrete surface by giving it a gorgeous wet look. The sealer is not very durable as it is a water-based sealer and will have to be applied on an annual basis. Whatever rust-oleum sealers that you decide to choose to ensure that it meets the needs of your concrete surface. Also, you can choose based on how you want your concrete to appear. If you want a clear look, then the Rust-Oleum dust proofer floor sealer is the best. But if you want your concrete to have a wet look, then the Rust-Oleum wet look sealer is the best option for you. And if you want a long-lasting one, I recommend the rust-oleum dust proofer with acrylic formula. Water-based sealers such as the Rust-oleum wet look don’t last for long and are costly to maintain. Q. How will my concrete look after applying? Ans. This depends on the type of sealer that you are using to seal the surface with. Some sealers are invisible while others will leave a glossy finish. A good number of chemically reactive sealers are almost invisible as they penetrate into the concrete. While solvent-based acrylic resin sealers and epoxies offer significant color enhancement. Q. How do I apply the concrete Sealer? Ans. Most of the concrete sealers on the market can be applied by a DIYer by using either a sprayer or a roller. All you need is to follow the right steps and seal your concrete. But high-performance sealers need professional installation such as polyaspartic urethanes, polyureas, and 100% solid epoxies.